Little change occurs down here when the fall ferry schedule flips over to winter. It’s pretty much a San Juans deal. On Sunday, service to Sidney, British Columbia, will be suspended. Weekend service will drop to three boats but remain at four on weekends. And there are a few other minor tweaks. One thing West Sounders might want to take note of, however, is the extension of reservations to the San Juans. Many of us try to get up there occasionally. We can now use a reservation system to ensure we’re not sitting for hours waiting to get on a boat. It’s good for customers because travel is predictable and it helps the ferries system by spreading demand from peak travel times to less crowded sailings. Check out the Save A Spot website. The reservations program is growing. It started out with the Canada-Anacortes route, then spread to Port Townsend-Coupeville. After Washington State Ferries lost license tab funding 15 years ago, it figured it couldn’t keep building bigger boats and terminals. It needed to make better use of the ones it has. Reservations help in that regard. If you can look up and find that the next two sailings are full, you won’t sit at the dock waiting. So the dock won’t get so full. You can pop to the terminal a few minutes before your reservation and not waste a lot of time. I don’t know how it would work down here on the commuter oriented routes. Maybe someday we’ll see. Changes are coming to the Kitsap Transit board next year. Ed Wolfe, in his first meeting of any type as a Kitsap County commissioner Tuesday, was named vice-chairman of the board. Wolfe, who beat Linda Streissguth in November, took over the position early because Streissguth had been appointed instead of elected. He was the only choice for vice chair because the other two county commissioners, Rob Gelder and Charlotte Garrido, had recently served as chairs. The chairmanship switches every two years between county and city representatives. Bremerton mayor Patty Lent will move up from vice chair to replace Gelder next month. She’s a huge proponent of cross-sound fast ferries, which will be a major topic in 2015. Gelder, chairing his final meeting, chose Bainbridge Island councilman Steve Bonkowski as the at-large board member. Bonkowski replaces Port Orchard councilman Rob Putaansuu, who’s served in the at-large role ever since it was created four years ago. A sharp and nice guy, he did a great job, though his name is hard to spell. Before that, Bremerton had three people on the board — the mayor and two council members. That’s now down to two. The at-large rep is from one of the three smaller cities. With Putaansuu, the Port Orchard had four people involved in Kitsap Transit leadership. Councilman John Clauson is the transit executive director, councilman Jeff Cartwright the transit human resources director, and Mayor Tim Matthes and Puttaansuu were on the board. Beginning in January, board study sessions and meetings will be held on the first Tuesday at 8 a.m. and 9 a.m., respectively, instead of the third Tuesday at 9 and 10:15. Subcommittee meetings will be the third Tuesday at 8 for ferries, 9 for planning and 10 for personnel. Gov. Jay Inslee will outline a new transportation revenue plan tomorrow for the Legislature to consider during its 2015 session. It will be held in conjunction with an event marking completion of the Highway 520 Eastside transit and HOV project at 10:30 a.m. at the new Evergreen Point road lid. It’ll be televised by TVW. Inslee’s office, in an announcement today to announce tomorrow’s announcement, said the multi-billion-dollar package would fund safety, maintenance and preservation projects, finish highway improvements that would provide jobs, traffic relief and economic development, and invest in multimodal programs that provide more travel options. The package also includes accountability and reform measures to ensure projects are delivered on time and on budget. Reforms were given as the major deal-breaker in an attempt to pass a package last session. The House approved a plan. The Senate, which was hung up on the reforms, had one but never brought it to a vote. It’ll be interesting to see how Inslee’s plan compares. With the National Weather Service predicting up to 70 mph gusts over the next day, how fast must the wind be blowing before the state shuts down the Hood Canal Bridge? I vaguely remembered it being 35 mph over a sustained period, not just a gust here and there. Wrong, said DOT spokeswoman Claudia Bingham-Baker. More likely than not, opening the draw span wouldn’t have anything to do with the bridge itself. What happens, she explained, is when winds reach 30 mph for 15 minutes, an alarm sounds. Bridge crews are dispatched to watch how it responds to the waves. It will react differently depending on the wind’s direction. If it gets too bouncy, they can open the draw span and relieve pressure. The world’s third-longest floating bridge withstands winds better since the east side was replaced in 2009, Bingham-Baker said. Wonder if it would withstood a pounding like took place on Feb. 13, 1979. Winds gusting from the southwest at up to 120 mph aligned exactly with the direction of the canal. I can’t even imagine 120 mph winds or remember where I was. In the natural wind tunnel, the bridge was the only object resisting. Waves 10 to 15 feet high crashed against it for hours, until finally the western floating portion sank. Today, it’s more likely the span would be opened and traffic stopped because drivers can’t stay in their lanes and are freaked out by splashing waves than fear that the storm will damage the bridge, Bingham-Baker said. 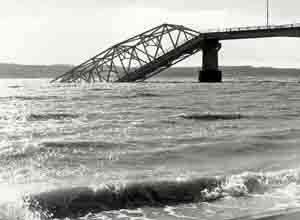 Oddly, it took winds of just 40 mph to blow down the first Tacoma Narrows Bridge on Nov. 7, 1940. It was just four months old. It’s used as an example of a major engineering failure because it had some vertical plates that caught the wind and caused it to sway violently.